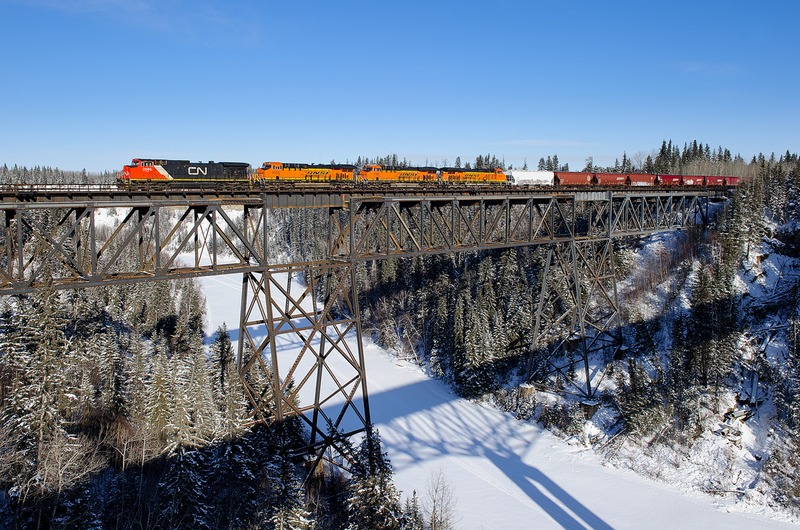 Railpictures.ca - Tim Stevens Photo: CN C44-9W 2566 teams up with BNSF ES44C4s 8355, 7190 and 4256 leading CN detour train F30541 05 across the Pembina River between Entwistle and Evansburg, Alberta. This is BNSF’s G AVIKAL9 05 detouring from Noyes, MN to Vancouver, BC due to ongoing issues on BNSF’s Hi-Line Subdivision in Montana. | Railpictures.ca – Canadian Railway Photography – photographie ferroviaire Canadienne. Copyright Notice: This image ©Tim Stevens all rights reserved. Caption: CN C44-9W 2566 teams up with BNSF ES44C4s 8355, 7190 and 4256 leading CN detour train F30541 05 across the Pembina River between Entwistle and Evansburg, Alberta. This is BNSF's G AVIKAL9 05 detouring from Noyes, MN to Vancouver, BC due to ongoing issues on BNSF's Hi-Line Subdivision in Montana.